Five star hotels in Melbourne give you ultimate luxury, style and service. These are generally the well-established prestige hotels with the highest degree of quality, personal service and consistency. They tend to have multiple restaurants with extensive gourmet menus on site, 24-7 room-service, as well as a fitness centre, valet parking and concierge service. However, there is no standardised international star rating system and some hotels are self-rated. Most Melbourne five star hotels are in the CBD and its periphery. If you like to be amidst Melbournes café and night life, you might prefer to stay right in the heart of the city. For a bit more serenity, there are the Southbank luxury hotels, or for convenient travel there is a 5 star hotel at the airport. Prices for five star Melbourne Australia hotels vary according to the season and Melbourne events. Discounted prices, way below hotel rack rates (standard rates), are available over the internet. For secure bookings, guaranteed best prices and last minute hotels, you can make a booking here. Sofitel Hotel Melbourne On Collins  one of Australias most luxurious five star hotels in a great location in Melbournes Paris end. Understated luxury, comfort, elegant dining and spectacular views over Melbourne! The Langham Hotel Melbourne  your traditional luxury hotel and one of the finest in Melbourne. Timeless poise and elegance on the south side of the Yarra. The Stamford Plaza Hotel Melbourne  both, a comfortable 5 star hotel and one of the most luxurious boutique hotels in Melbourne. You get a comfortable suite - a stylish home away from home. Hilton Hotel Melbourne x 2  two stylish qualilty hotels: the Hilton on the Park in East Melbourne and the modern Hilton Melbourne South Wharf. Parkroyal Melbourne Airport Hotel - a comfortable 5 star hotel only a short walk from Melbourne airport - an ideal place to check-in quickly the next day! 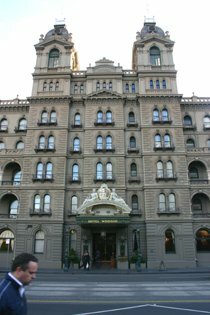 This list is being expanded regularly to include other Melbourne 5 star hotels.